NASA’s Hubble Space Telescope has observed a planet outside our solar system that looks as black as fresh asphalt because it eats light rather than reflecting it back into space. This light-eating prowess is due to the planet’s unique capability to trap at least 94 percent of the visible starlight falling into its atmosphere. The oddball exoplanet, called WASP-12b, is one of a class of so-called “hot Jupiters,” gigantic, gaseous planets that orbit very close to their host star and are heated to extreme temperatures. The planet’s atmosphere is so hot that most molecules are unable to survive on the blistering day side of the planet, where the temperature is 4,600 degrees Fahrenheit. Therefore, clouds probably cannot form to reflect light back into space. Instead, incoming light penetrates deep into the planet’s atmosphere where it is absorbed by hydrogen atoms and converted to heat energy. But the planet’s nighttime side is a different story. WASP-12b has a fixed day side and night side because it orbits so close to the star that it is tidally locked. The nighttime side is more than 2,000 degrees Fahrenheit cooler, which allows water vapor and clouds to form. Previous Hubble observations of the day/night boundary detected evidence of water vapor and possibly clouds and hazes in the atmosphere. WASP-12b is about 2 million miles away from its star and completes an orbit once a day. The researchers determined the planet’s light-eating capabilities by using Hubble’s Space Telescope Imaging Spectrograph to search in mostly visible light for a tiny dip in starlight as the planet passed directly behind the star. The amount of dimming tells astronomers how much reflected light is given off by the planet. However, the observations did not detect reflected light, meaning that the daytime side of the planet is absorbing almost all the starlight falling onto it. First spotted in 2008, WASP-12b circles a Sun-like star residing 1,400 light-years away in the constellation Auriga. 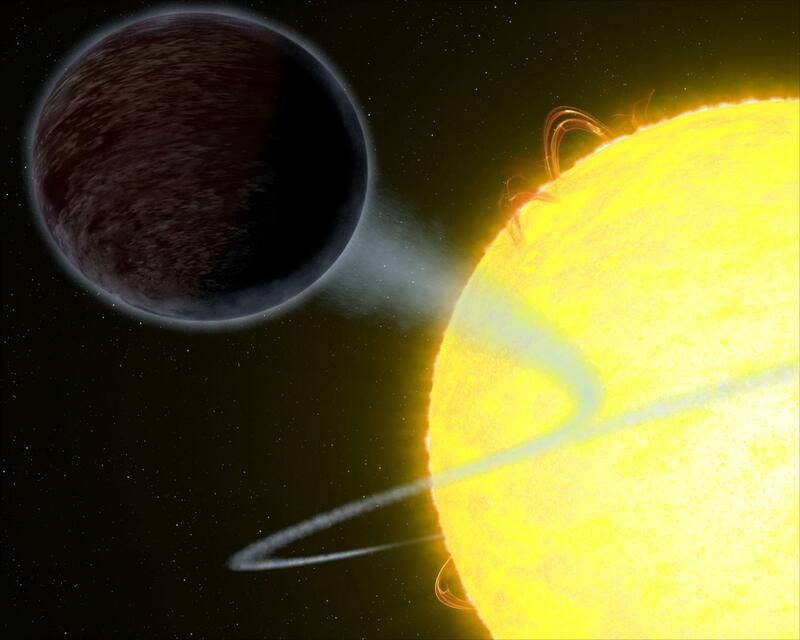 Since its discovery, several telescopes have studied the exoplanet, including Hubble, NASA’s Spitzer Space Telescope, and NASA’s Chandra X-ray Observatory. Previous observations by Hubble’s Cosmic Origins Spectrograph (COS) revealed that the planet may be downsizing. COS detected material from the planet’s super-heated atmosphere spilling onto the star. The results will appear in the Sept. 14 issue of The Astrophysical Journal Letters. For additional information, visit: http://hubblesite.org/news_release/news/2017-38.